When building a new home there are many components to consider. The foundations of the home are the most important component as this will support the entire structure by transferring the weight of the home to the ground. Who Designs Foundations for Homes and What is Involved? House foundations are designed by an engineer and take into account the soil that the home is to be built on, the slope of the land and the weight of the building. Before an engineer can design a footing system for your home they will require a soil report. The purpose of the soil report is to test the bearing capacity of the soil and what level of reactivity the soil will have to moisture conditions. The soil test is done by taking samples of the soil at a number of locations across the site (referred to as bores). These samples are then tested in a laboratory and classified into the categories set out in Australian standard 2870. A – Stable Non-Reactive, Applies Most sand and rock sites with little or no ground movement from moisture changes. P – Problem soil – Sites with inadequate bearing strength or where ground movement may be significantly affected by factors other than reactive soil movements due to normal moisture conditions. P sites include soft or unstable foundations such as soft clay or silt or loose sands, landslip, mine subsidence, collapsing soils and soils subject to erosion, reactive sites subject to abnormal moisture conditions and sites that cannot be classified in accordance with the above classifications. The soil classification will help the engineer determine depth of foundation, the grade of steel to use and strength of concrete to be used. All foundations need to be founded in natural ground. Natural ground is referred to as undisturbed ground on the site. If natural ground is particularly deep or the site has uncontrolled fill on it, the foundation will need to be bored through the poor soil and into natural ground. These are called bored piers and are common throughout Melbourne. Concrete strength is referred to in MPA. Standard slabs will require a 20 or 25 MPA concrete. Stronger slabs may require 32MPA concrete. The steel is added to give the concrete more strength and stiffness. Steel mesh reinforcement is added for additional strength. The engineer will call up the mesh by the the required size to achieve the needed stiffness for the slab. Square mesh is designated by the following sizes SL62, SL72, SL82, SL92 or SL102. The first digit refers to the diameter of the bars. The last digit refers to the spacing of the bars. For example, SL72 has diameter 7 mm bars, which are on a grid of 200 mm apart. The higher the rating the stronger the mesh. The more steel the stronger the slab. Stronger slabs may have 2 layers of mesh as opposed to the one normally used. In addition, the soil report will determine the depth that the concrete rib of the slab is to be founded in the ground. Generally, the deeper the founding depth, the stronger the slab. With today’s modern architecture and difficult sites, it is not unusual for all four types of foundations to be used in the one house. You can learn more here about the building process. How Much are House Foundations? Foundations are sometimes charged at a cost per square meter. However, laying foundations is more than just the type of foundation, there are other considerations that you will need to account for in the planning of this, which we can talk to you about. These include drainage, heating and sealing. Making sure you include everything you need for your house foundations up front can save you in the longer term. 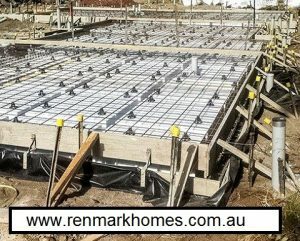 When you build with Renmark, we liaise with the engineer on your behalf and advise you accordingly. Can You Soil Test Prior to Purchasing Land ? You can purchase a block subject to a soil test, however that’s more of a legal matter under the contract. If you did purchase subject to a soil test, there would need to be a condition met, allowing you to not proceed. So it wouldn’t be subject to soil test, but rather subject to a soil test that meets a specified criteria in your purchase contract. i.e. contamination, rocks, poor soil conditions. All soils will have a foundation plan and design that will work albeit an expensive alternative to normal soil conditions if that happens to be the case. If that’s an issue for you, speak to your legal team for further information. Do You Get a Say in the Type of Foundation For a New Home? Clients may have a preference for a type of foundation or may dislike a type of foundation system. Ultimately however it’s the engineer that will design to the soil conditions and plans. This is their area of expertise in order to give you the safe, luxurious home you want built. If you have a great piece of flat land and you want to capitalise on your investment then have a chat to us about dual occupancy.